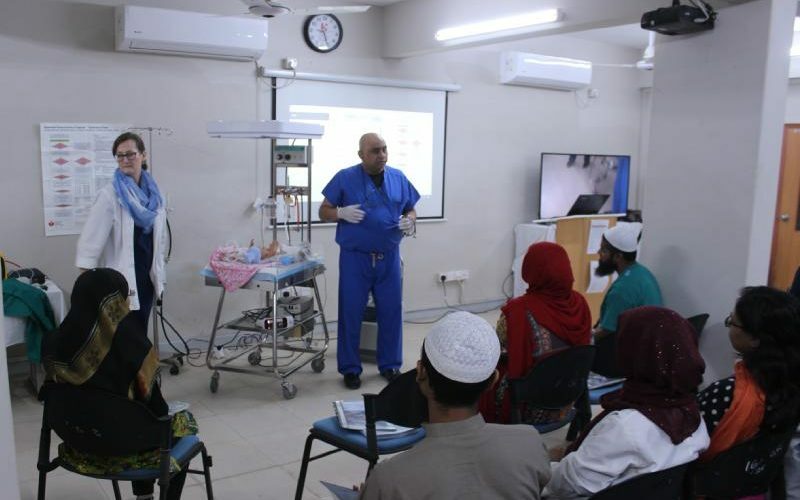 The Indus Hospital’s Sheikh Saeed Memorial Campus in collaboration with Emergency Response Committee (ERC, TIH) organised a Neonatal Resuscitation Programme (NRP) on January 28, 2019. The training is a constant feature of continued medical education at TIH. The programme was meant to equip physicians; nurses; midwives and other healthcare providers caring for neonates in the delivery room, newborn nursery, special care nursery, and neonatal intensive care unit. More than 20 healthcare providers attended the workshop and received certificates. Dr Misbah Qureshi, and Ms Nancy Young facilitated the course. Dr. Qureshi is a neonatologist in Fredericksburg, Virginia, USA and is affiliated with Children’s National Medical Center, USA. He specialises in Neonatal-Perinatal Medicine. Ms. Young is skilled in educating nurses, midwives, physicians, and traditional birth attendants in the principles of immediate newborn care. The comprehensive, simulation-based training programme was based on the most recent recommendations put forth by the International Liaison Committee on Resuscitation in conjunction with the American Academy of Pediatrics Neonatal Resuscitation Steering Committee. Simulation is an instructional strategy where learners are immersed in realistic scenarios designed to resemble actual experiences. The NRP is an evidence-based programme which uses adult learning principles for multidisciplinary educational goals and objective using formal instruction-based training and certification. During the workshop, participants received training on: foundation for neonatal resuscitation; newborn care; positive-pressure ventilation; alternative airways; chest compressions; medications; resuscitation and stabilization of babies born preterm.